The Intermec ScanImage 1470 has been discontinued. No direct replacement is available. Full omnidirectional 2D Image Reader with image capture technology. Rightly suited for a wide spectrum of industries, the ScanImage 1470 imager is ideal for warehouse and distribution, retail, packaging, printed circuit board manufacturing and health care/clinical applications--essentially anywhere omnidirectional and/or 2D imaging is required. The ScanImage 1470 seizes data at a high-speed 30 frames per second. A scanning range of up to 9 inches on linear barcodes, ergonomic design, and a new intuitive, bright, sharp scan line make the ScanImage 1470 extremely user friendly. All units ship with product documentation. High density 2D imager. Order cables & power supply/AC adapter separately. See accessories. Standard density 2D imager. RS-232 communications. Order cables & power supply/AC adapter separately. See accessories. 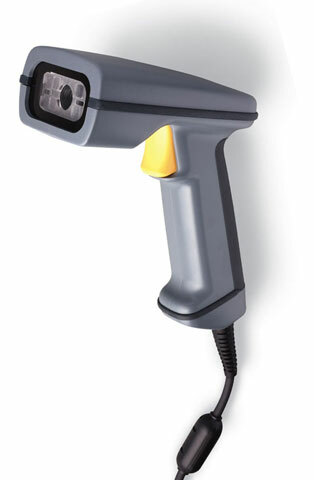 Standard 2D imager. Order cables & power supply/AC adapter separately. See accessories.